Have you ever thought about dumping your boring non dog-loving or even non dog-friendly day job? Would you switch your grumpy co-workers for tail-wagging furry ones? Then think about becoming a fulltime pet sitter. I have one friend and two former colleagues who’ve done it, plus several of our columnists do it. Although you may never get rich in worldly goods, you’ll certainly have a rich and rewarding job. 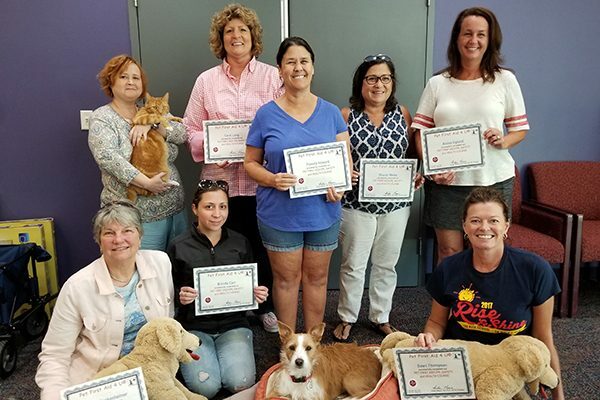 Professional pet-sitting organizations like Pet Sitters International offer hands-on seminars to teach pet sitters all aspects of the profession. Photography Courtesy Pet Sitters International. Before you embark on your own adventure, I recommend you join one of the national dog sitting organizations. These organizations have training, newsletters chock full of tips and a supporting community, all of which you will need to become a professional pet sitter. Next, decide if you will work for yourself or work for a local pet-sitting company. It may be wise to work for a local pet-sitting company first to see if this is what you want to do before investing in your own company. If you want to create your own company, you may want to join some professional pet organizations like the American Pet Professionals. Graduates of the PetFirstAid4U class. Photography courtesy Courtesy Arden Moore/PetFirstAid4U. I strongly recommend you become certified in pet first aid. All pet parents should do this, but pet sitters really need to know what to do in case of emergency. There are certification classes out there like Pet First Aid 4U. I’d also find a vet or pet behaviorist to consult with as necessary. I also recommend you take and continue to take as many animal behavior educational classes that you can. Perhaps you already know a lot about dogs. But what if the client has parrots, hamsters, ferrets or cats? Trust me, as a longtime parrot parent, they are nothing like dogs or cats and you’ll find yourself over your head very quickly if you don’t know the basics. Each one of these animals has local clubs and organizations that would be happy to help you (plus it’s a great way to network!). If you decide to specialize, you’ll still want to take yearly classes to keep up with the latest information in training, socialization and laws. You’ll have great tips to pass along in an email to your clients. You need to stay on top of the latest information, so I advise you to get several relevant publications (like Dogster, The Whole Dog Journal and Cornell University’s DogWatch to name a few). OK, I had to plug Dogster and some of its sister publications! Anyway, if I wasn’t so fortunate to be able to combine my profession — publishing — and my passion — dogs — I’d be working my way through the certification process right now! If you decide to become a professional pet sitter, let us know. We’d love to hear about it. Thumbnail: Photography courtesy Melissa Kauffman. Stay tuned for more from Executive Editor Melissa Kauffman on Dogster.com’s Dug Up at Dogster column and on social media with #DogUpatDogster. The post Dug Up at Dogster: Dump Your Boring Day Job and Become a Professional Pet Sitter appeared first on Dogster.